Smother your garden in glorious trumpet flowers. This colourful and exotic looking ‘trumpet vine’ is the perfect exotic climber to bring a taste of the Mediterranean to your patio this summer! Ideal for growing around terraced and patio areas where the colourful blooms will smother walls and structures in a profusion of flowers through the summer each and every year. Bearing the classic ‘trumpet’ shaped flowers from which they bear their name, they're a magnet to bees and butterflies. Vigorous and fast growing with high resistance to pests and diseases. Supplied as a 2L potted plant. 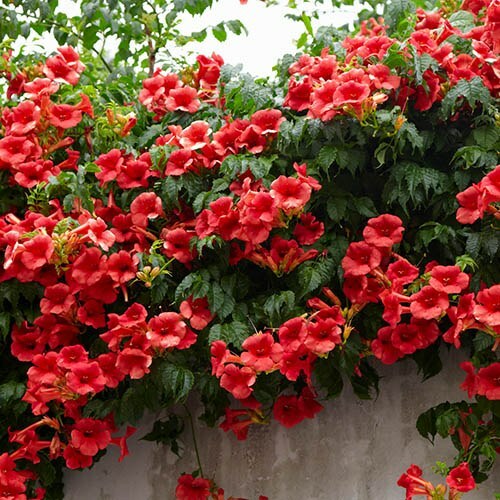 Create the most wonderful, bold and bright climbing display that’s ideal for growing around terraced and patio areas where the colourful blooms will smother walls and structures in a profusion of flowers through the summer each and every year. Bearing the classic ‘trumpet’ shaped flowers from which they get their name, the contrast between the bright orange/red flowers against the backdrops of glossy green leaves is a real eye-catcher. Vigorous and fast growing, you’ll produce a display to show off in no time, but you can keep the vines in check with a little prune every year and what’s even better is their resistance to pests and diseases that make them an easy choice to grow!